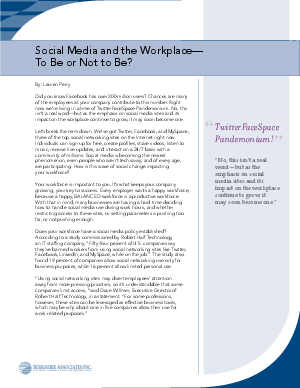 > Research Library > Berkshire Associates > Social Media and the Workplace- To Be or Not to Be? Does your workforce have a social media policy established? According to a study commissioned by Robert Half Technology, an IT staffing company, “Fifty-four percent of U.S. companies say they’ve banned workers from using social networking sites like Twitter, Facebook, LinkedIn, and MySpace, while on the job.” The study also found 19 percent of companies allow social networking use only for business purposes, while 16 percent allow limited personal use.